A cry for developing student's creativity, critical thinking, communication, collaboration and citizenship skills? Organizers at P21 believe that “all learners need and deserve 21st century learning opportunities to thrive as tomorrow's leaders, workers, and citizens” (p21.org). In order for the United States to remain competitive with other high performing countries, we must change our school systems to reflect those of other high performing systems. Many US school systems focused their efforts on math and English concepts so the students would perform well on assessments under No Child Left Behind (NCLB). However, what researchers have found is that the assessments that the educators use in other high performing countries, Hong Kong, Finland, Singapore, Australia and Canada--do not test reading and math skills. These high performing countries are not assessing their students using multiple choice types of tests. Program and International Student Assessment (PISA, 2012) has found that the education system in these countries has students reading, writing, producing and analyzing data. Therefore, the education system in the United States needs to shift our focus to also assess our students on more higher order type of assessments and performance tasks. Education administrators need to shift the focus per the P21 Framework. In order for the United States to remain competitive in global markets, we need to change how we assess our students. We need to remind the students they will be building their communication, creativity, critical thinking, collaboration and citizenship skills-the 5C’s. Citizenship, Communication, Creativity, Critical Thinking, and Collaboration skills help to prepare students for success in college and careers beyond high school. “Learning takes place throughout life in many places and spaces. From birth through (students’) careers, learners need a broad range of experiences that develop their skills, dispositions and abilities to succeed (P21.org). Communication—students share their written and oral thoughts questions, ideas with each other. Creativity—students think about or come up with new, innovative ways or different approaches to solving problems. Students can demonstrate their creativity through the use of technological or artistic approaches. Collaboration-students work interdependently to reach a goal together. Citizenship- students understand there are procedures, processes and guidelines by which a good citizen will follow. 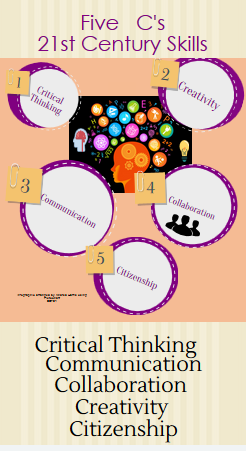 Critical Thinking-the student comes to a solution by linking knowledge across disciplines and subjects. In order for the US to remain competitive in the global marketplace and the student to succeed in college and careers beyond the 21st century students must develop the skills in the area of the 5C’s.—communication, creativity, collaboration, critical thinking and citizenship.